In the 1860’s, the Lowell apothecary of Carleton and Hovey began marketing a proprietary medicine named for a local Irish-Catholic priest, Father John O’Brien. This tonic became so popular that the apothecary was renamed Father John’s Medicine Company. The collection contains business accounts for several years at the turn of the 20th century, sample bottle labels, sound recording advertisements and promotional films. Benjamin Franklin Butler (1818 – 1893) was a Lowell lawyer who became a Civil War General, Congressman and Governor. This collection, much of which was purchased with a donation from the Whit Pearson Memorial Fund, includes personal letters, photos and portraits of Butler, Stevens and Ames family members and a series of Thomas Nast political cartoons of Butler. Recent acquisitions include political cartoons from the A.L. Eno, Esquire collection. This is a cross-post from LHS Board member Eileen Loucraft’s personal blog Lowell Doughboys. Lowell Textile Institute had 23 students sign up for the 26th Yankee Division Battery F Field Artillery unit. They all served together and due to their superior mathmatics they were a great asset at firing the guns. They were the most accurate of the division’s artillery units.The 23 men were: Pvt. Eugene R. Ackley, ’19; Lieut. Wilbur F. Berry, ’17; Lieut. Russell L. Brown ’19; Corp. Mahlon W. Dennett, ’18; Bugler Walter S. Douglas, ’19; Corp. Richard F. Hadley, ’19; Lieut. John S. Holden, ’19; Sergt. Carleton R. Hosley, ’19; Corp. George H. Johnson, ’18; Pvt. John F. Larratt, ’19; Sergt. Bryan Leonard, ’19; Corp. Eric T.L. Laurin, ’18; Sergt. Carl E. Matthews, ’17; Pvt. Dan W. Moorhouse, ’19; Pvt. Brackett Parsons, ’19; Pvt. Walter W. Powers, ’17; Sergt. Lester E. Parker, ’20; Pvt. Herbert C. Roberts, ’20; Pvt. Carl G.V. Sjostrom, Jr., ’19; Corp. Frank L. Thayer, ’19; Sergt. Joseph A. Webster, ’20; Corp. Philip J. White, ’19. The following is from a speech by Lieut. Russell L. Brown given at the dedication of the Mahlon Webb Dennett Gate on Saturday, May 18th, 1929. 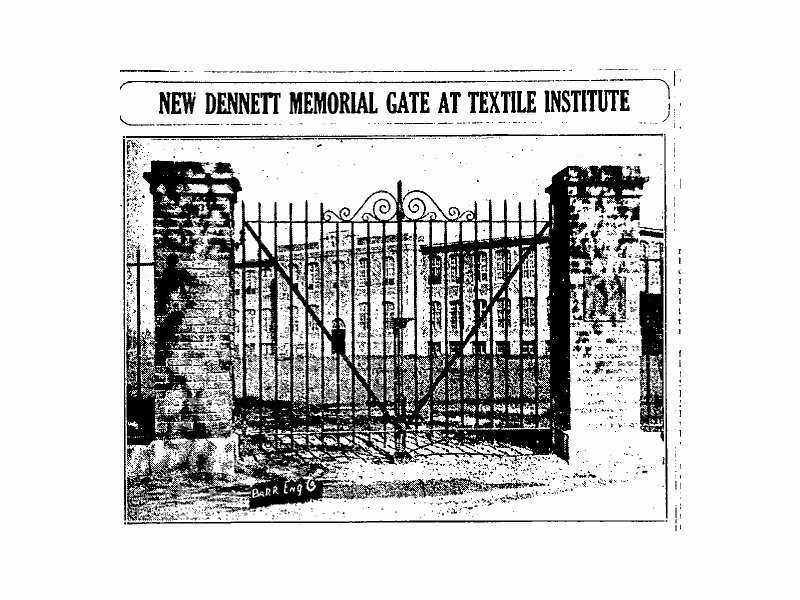 “Mindful of the loss of a comrade-in-arms, these men have arranged to erect a gate at the northwest corner of the school campus, as a memorial to Mahlon Webb Dennett, who died in France. Corporal Mahlon W. Dennett, son of Dr. D.C. Dennett of Winchester, Mass., was born June 10, 1884. In 1917 while in his third year as a student chemist, class of 1918, at Lowell Textile Institute, he enlisted in Battery B, 2nd Mass. regiment, which later became Battery F, 102nd field artillery, 26th division, AEF. As the battery progressed from the training period to actual combat at the front, Corp. Dennett, by virtue of his knowledge of chemistry, was made gas corporal, and after a short schooling in gas technique was made responsible for the safety of the personnel during gas attacks. It was Corp. Dennett’s duty to see that all gas masks were in good condition, that all dugout were properly blanketed, that the men were acquainted with effects and antidotes for various kinds of gas poisoning. In event of gas attacks he was to sound the alarm and see that all precautions were taken to avoid casualties. In addition to this Corp. Dennett assisted in helping maintain liason with telephone and rocket posts. The success of his efforts and faithfulness to duty is shown by the fact that in spite of many vicious gas attacks there was not one death from gas poisoning in the battery. At the second battle of the Marne after firing steadily for days, the battery moved forward successively until it located on July 24 in an old German gun position on the edges of the woods. The place was near the front lines and the infantry, advancing to the attack, was breaking from column to skirmish lines of squads directly in front of the battery. The location was known exactly by the enemy, and soon a terrific barrage was falling on the guns. During this intensive fire a German 77 m.m. long fuse shell landed at Corp. Dennett’s feet as he lay in a shallow funk hole near the guns. Receiving the full effects of the lateral spray Dennett was mortally wounded. His torso terribly mutilated, arms and legs broken, the fingers of his left hand cut off, his cry for help was answered by comrades scarcely 50 feet away. Capt. Lee H. Cover, Capt. Theo R. Johnson and Sergt. R.L. Brown were by his side at once together with Private Burke of the medical squad, who gave first aid and carried Corp. Dennett to the rear under shell fire. An ambulance carried the wounded man to Mobile hospital No. 2 and later to Evacuation hospital No. 7. So, now back to present day, the gate is long gone. In 1955, the area in front of Cumnock Hall was renamed as Dennett Mall. I need to walk the area to see if there are any memorial plaques in his honor anywhere on North Campus. The Board of Directors of the Lowell Historical Society will meet on Tuesday November 8, 2001 at 7pm at the Mogan Cultural Center. The regular agenda will be followed. In yesterday’s Lowell Sun, writer and history reseacher, David Peaver continues his occasional articles related to Lowell and the Civil War. He tells us the story of local historian, collector and Lowell Historical Society member Gary Koltookian and his research attempt to find more about Khachadour P. Garabedian, a Lowell mill worker who enlisted in the U.S. Navy in 1864 and is believed the only Armenian to have served in combat during the Civil War. The trail to a deteriorated headstone in a Philadelphia-area cemetery, and to the restoration of a Civil War sailor’s honor, started from a flea market in Hollis, N.H., in 1991. “Wow. 1855. An Armenian in Lowell,” he marveled. “There were not many Armenians in America in the 1850s,” says Koltookian, 78, a retired social-studies teacher whose ancestors arrived in the early 1900s 10 years into the first great wave of Armenian migration. And so the search began! Read the full Peaver article here at lowellsun.com. Reminder: the Sun archives their stories very quickly!